This article provides more detailed information about this herbicide. Chateau® is a group 14 mode-of-action herbicide. Compounds in this group are most active on broadleaf weeds. Before Chateau® became available, no other preemergence herbicide with the same mode of action was labeled for use in watermelons and cantaloupes. The active ingredient of Chateau® herbicide, flumioxazin, controls susceptible weeds by inhibiting propoporphyrinogen oxidase (PPO), an enzyme that controls chlorophyll synthesis. Because of chlorophyll production inhibition, a chain reaction occurs within the plant that causes cell membrane disruption. Chateau® herbicide can assist in the postemergence control of emerged weeds. It is taken up by roots, stems, or leaves of young plants. It kills weeds through direct contact. There is usually little or no translocation of the herbicide within plants. Foliage necrosis can be observed after 4 to 6 hours of sunlight following the herbicide application. 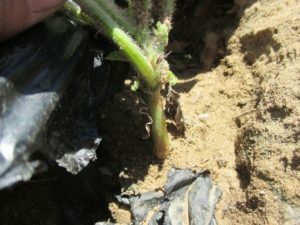 Susceptible plants die within one to two days. When used as a preemergent herbicide, soil moisture is required to ‘activate’ the herbicide as germinating weeds can only take up Chateau® in a soil-water solution. Because of this, Chateau® label states that ‘when adequate moisture is not received after a Chateau® herbicide application, weed control may be improved by irrigation with at least ¼ inch of water’. Research has shown that light is required for the activity of Chateau® herbicide. Because of this, if Chateau® is incorporated deeply in the soil, its effectiveness is greatly reduced. In the label, it states that ‘if emerged weeds are controlled by cultivation, residual weed control will be reduced’. The likelihood of leaching of chateau herbicide is relatively low since it has low solubility in water and nonionic charge in soil. The most common means of loss of Chateau® in the soil is due to degradation by soil microbes, while volatilization or photolysis of the product are minimal. Chateau® can only be applied with a shielded sprayer in row middles between raised plastic mulch beds before transplant for melon production. More restrictions about the raised bed can be found in the 24(c) label. In addition, a rainfall or overhead irrigation after application but prior to transplanting is required, which helps to wash away chemicals that may contact the plastic mulch. The first symptom of watermelon seedlings exposed to Chateau® herbicide is usually a water-soaked appearance, an indication of membrane damage, followed by desiccation and necrosis of the affected tissue (Figure 1 and 2). The symptoms in the pictures were caused by spraying Chateau® herbicide over plastic mulch beds before transplanting. Rain occurred immediately after transplanting which contributed to some of the product being washed into the transplant holes, causing damage to the transplants. 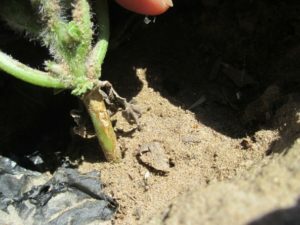 The injured plants were stunted (Figure 3). As a result, early watermelon yield was reduced. It is important to note that applying Chateau®over the plastic is against the label. The potential risk was clearly shown in our results. Growers who chose to use Chateau® herbicide should clearly understand the risk of crop injury associated with using this herbicide, and strictly follow the labels to reduce the risk as much as possible. Figure 1. Note the water-soaked area on the stem. Figure 2. The water-soaked area became necrotic. The stem is brittle and easily broken. Figure 3. Growth of the injured watermelon plant (left) was greatly inhibited compared to the control plant (right). Pictures were taken 18 days after transplanting.